Hello and welcome! It's Sara Emily here to host our newest challenge at Frilly and Funkie. I'm calling my challenge 'Impress Us'. Who doesn't want to make a great first impression? 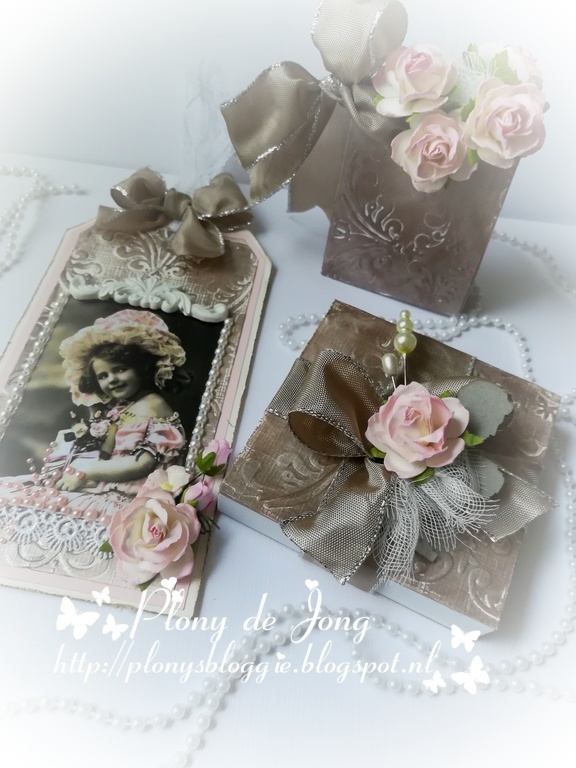 For this challenge, we would like you to use your embossing folders or any other way you can make an impression on your vintage or shabby chic project. Go ahead and 'Impress Us' with your creativity! Now it's your turn to 'Impress Us'! Enter your Vintage or shabby chic projects below; we can't wait to see what you will create! Remember to come back tomorrow to see what our latest Guest Designer has in store for us. There will be even more inspiration from the Funkie side of the Design Team next week too, so be sure to visit us again next Wednesday. Hi everyone! 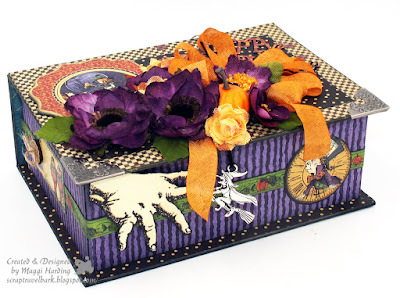 Today we announce our top picks from the 'Haunted Halloween' challenge. We loved seeing so many spooktacular Halloween makes. Thank you to everyone who joined in the fun. 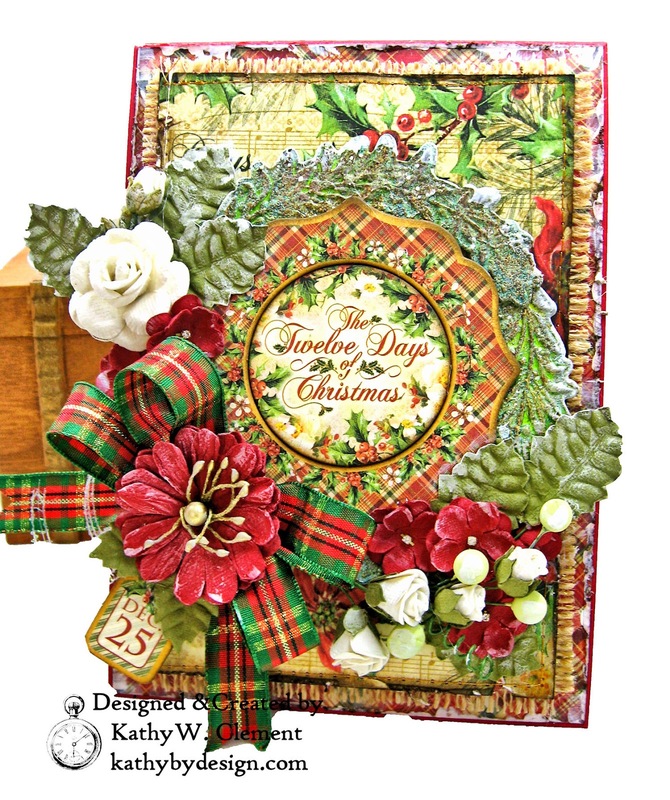 We had so many super entries that picking just one was tough but the Design Team finally chose #11 Debbie von Grabler-Crozier as our overall winner. 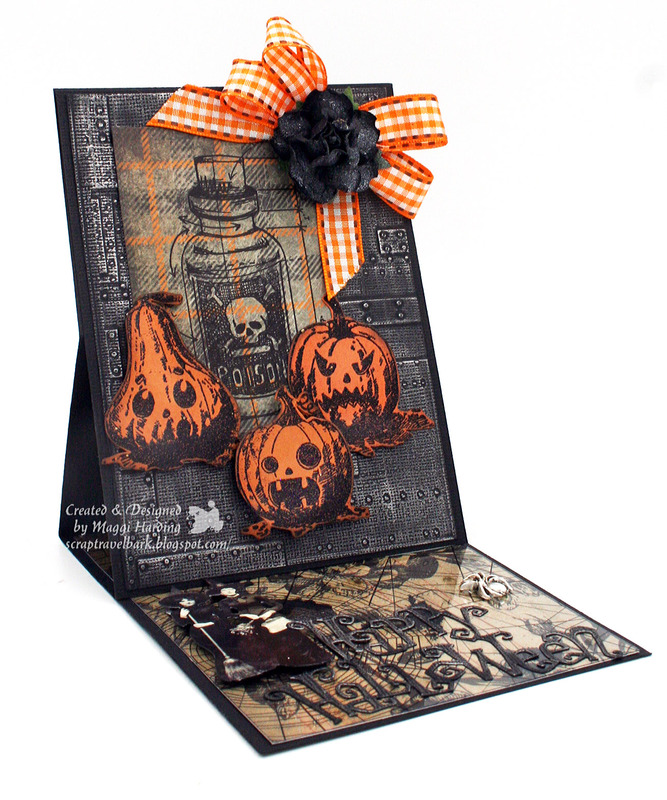 We loved all that clever shadow layering and the detail that went into each aspect of this wonderful card. Congratulations to Debbie on being our favourite and winning the opportunity to be a Guest Designer here at Frilly and Funkie for a future challenge. You will be contacted shortly with all the details. And now for the three winners of our Frilly and Funkie Top 3 Badges for this challenge; the choices this time were, in numerical order; #5 Ann Chuang, #14 Nancy (oops.design) and #25 Lisa Hoel. Please email Linda at thefunkiejunkie@gmail.com for the codes for the Top 3 badges so that you can display them proudly on your blog. And finally we have a randomly chosen lucky winner for the $25 gift certificate to The Funkie Junkie Boutique. Our congratulations this time go to #1 Julia Aston! Please email Linda at thefunkiejunkie@gmail.com for the gift certificate details. A big thank you again from the Frilly and Funkie team to everyone who took part in this challenge and congratulations to all our winners. The current challenge, 'Impress Us' runs through Tuesday, November 6th and the Design Team will be back here on Wednesday October 31st with some more inspiration for you. We hope to see you entering this time around so that you too can be in with a chance to win. Today we welcome our Guest Designer for the Impress Us challenge. Please say hello to Apollonia de Jong-de Bruyn (a.k.a. Plony) of Plony's Blog who was the Design Team's favourite from the All Creatures Great and Small challenge. Hi everyone, I am Plony and I live in The Netherlands in a small village close to Rotterdam. 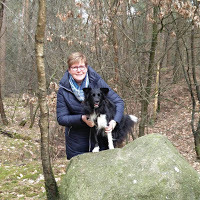 I am a wife, a mother and a grandmother and all this...and a lovely border collie in our family makes my days full of happiness. I am one of those people who just must do something and crafting fills the other part of my life. I started with knitting, crocheting, flower arranging and suddenly there was my card making addiction. I love to color with Copic markers and.....I love vintage. 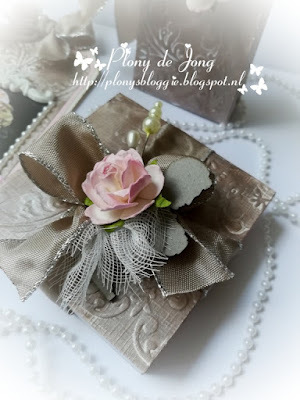 Cards, home decoration.....and preferably with a lot of lace, flowers, pearls.....that kind of (girly) things. I had to think about what to do with this theme and this is what I made. 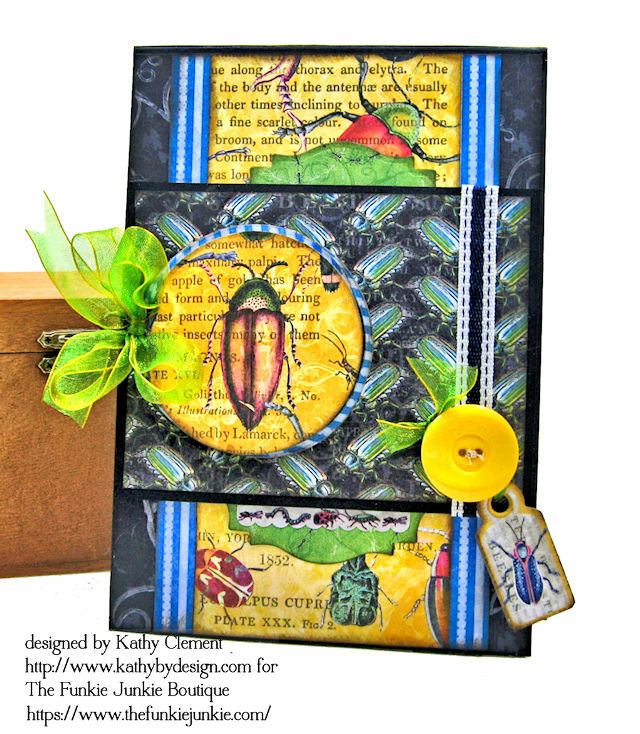 I started with a die to make a little bag, used an embossing folder to IMPRESS and added some color with finger wax. A few roses and a nice bow made it to a lovely little present. I decided this wasn't enough for a present so I made a matching tag. Again I used the embossing folder and the finger wax.....It's how much you use that makes the color darker. 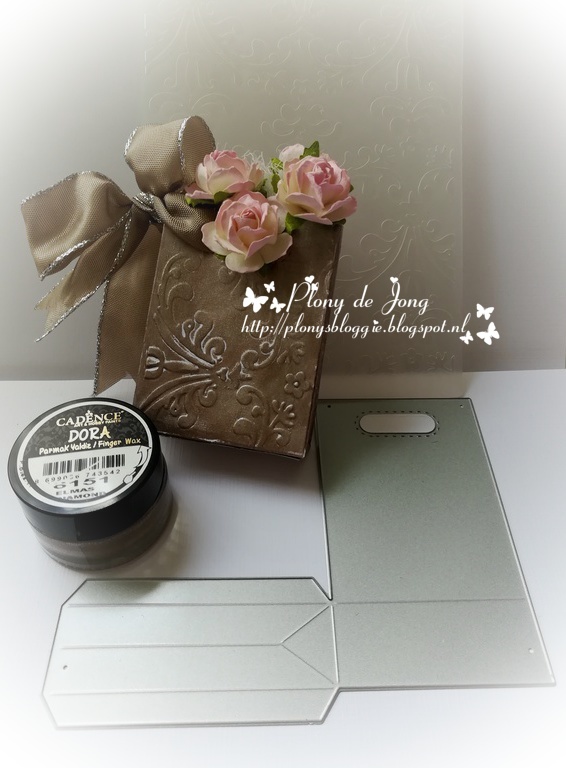 Eventually I made a note pad to add to the little present. I took a piece of paper, embossed it and waxed it, added this at the note pad with sticky tape, wrapped ribbon around it and added some sweet items to make this look pretty. I hope I succeeded in making the impression I had to make for the challenge. Here is another look at all three items. I thank the team of Frilly and Funkie for having me as a guest designer. It was a real honor. 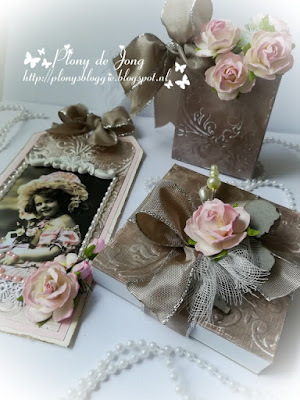 Pop on over to Plony's blog to check out all the details of her lovely trio of gifts and while you are there take a look at her other wonderful creations. 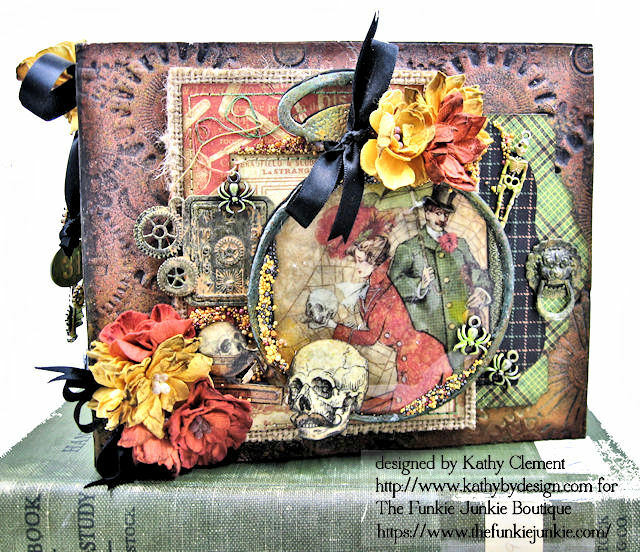 When you are done come on back and share your creation with us for the Impress Us challenge, which can be found HERE and runs through Tuesday, November 6 at 11:55 pm EST. 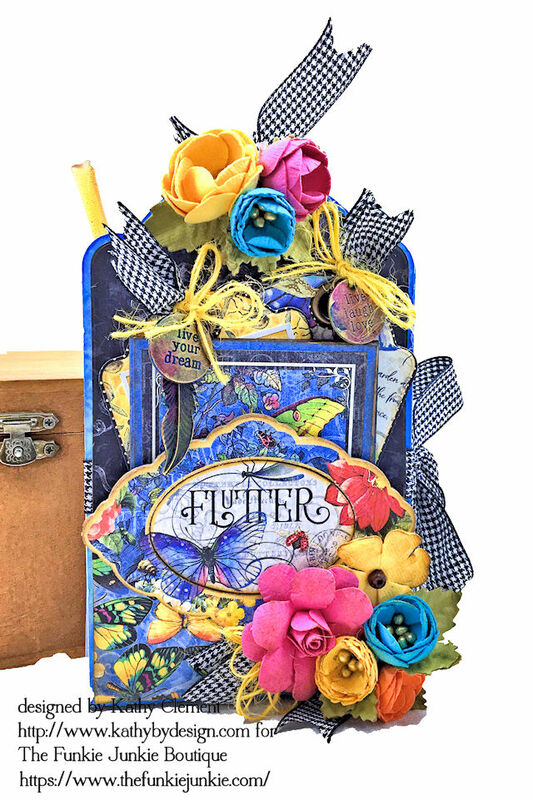 On Saturday one of our designers will be here with a fabulous Saturday Showcase that you won't want to miss and then next Wednesday the gals on the funkie side of the team will be impressing us with their makes for the challenge so do come back often. Hello, Friends! 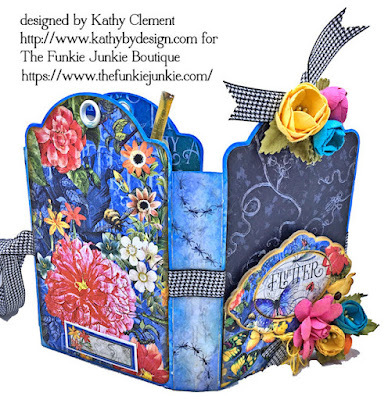 It's Kathy here with this week's Saturday Showcase. 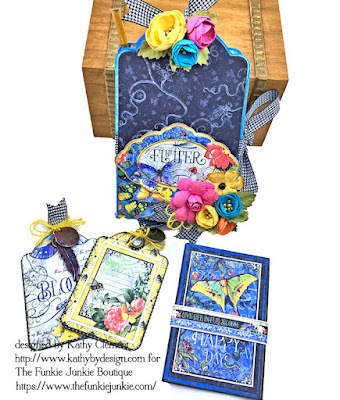 I'm thrilled to be shining a light on the fabulous new "Flutter" collection from Graphic 45! As versatile as it is vibrant, the patterns and images are easy to use in both frilly feminine and marvelous masculine projects. 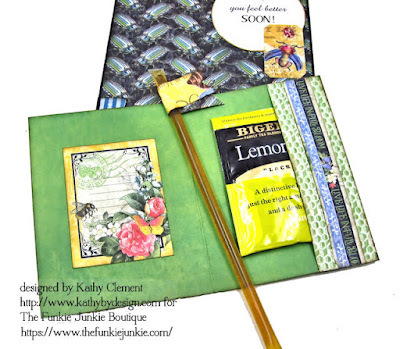 To showcase this lovely collection, I've prepared a Trifold Tag Folio with tutorial and a cheery masculine get well card. So grab a cuppa and let's get rolling! First, create a 5" x 7" card base from black cardstock. Next, line it with a 4 7/8" x 6 7/8" panel of the bug trails print from the "B" side of "Iridescent"
Now, cut a 3" x 4 7/8" panel from the "A" side of "Serendipitous. Then cut a 2" x 4 7/8" panel of the blue stripe from "Dazzling". Cut this in half to create (2) 1" x 4 7/8" strips. Then adhere a strip on either side of the "Serendipitous" panel. Adhere this to the card as seen in the photo. Next cut a 4 3/4" x 3 1/2" panel from the "B" side of "Serendipitous" . Cut a circle from the "B" side of "Dazzling" and adhere on the left as seen in the photo. 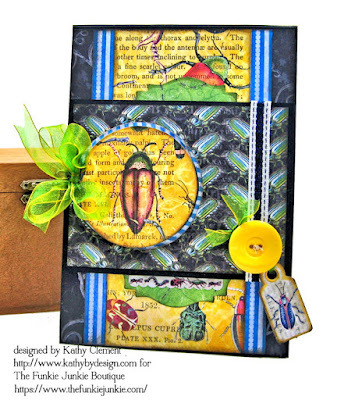 Use a slightly smaller circle die to cut out a bug image from "Serendipitous." 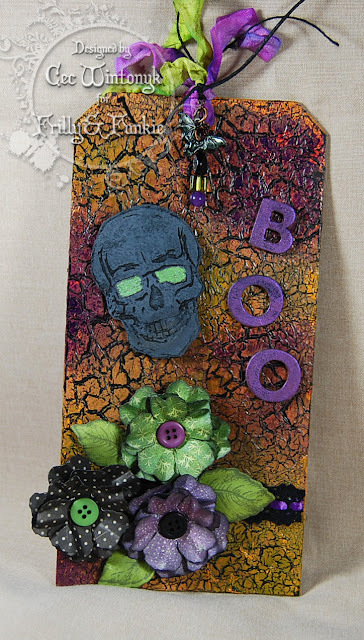 Back this with foam adhesive or waste chipboard and adhere over the "Dazzling" circle. Use a label die to cut a shape from the "B' side of "Exquisite." I used a Spellbinders Labels 18 Die, but the Tim Holtz Labels Dies from Sizzix would also have some great options that would serve the purpose here. Cut the shape in half from side to side. Adhere half at the top of the panel we created in the last step, and half at the bottom. 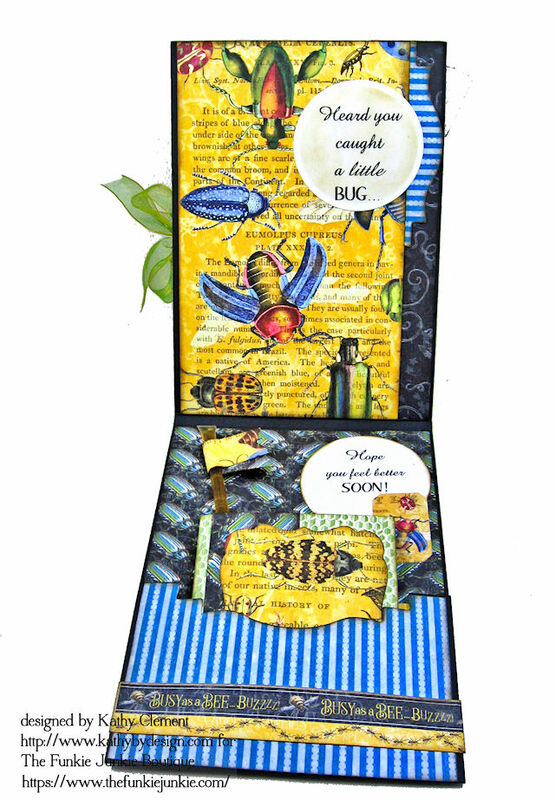 Adhere the small creepy crawlies sticker from the sticker sheet. Back this entire panel with foam adhesive or waste chipboard. 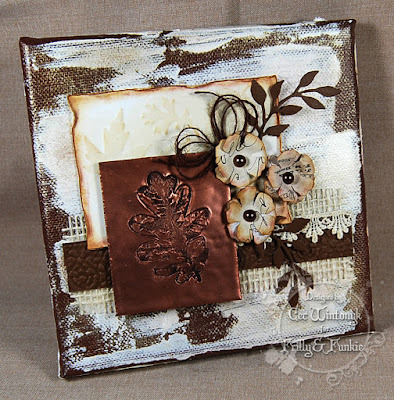 Wrap the right hand side with ribbon, attach a button and the chipboard tag and adhere to the card base. Tie a bow with iridescent green ribbon and adhere. The inside uses all the same papers. I computer journaled the sentiments, die cut with a circle die and added them in. As this is a get well card, I tucked in a little tea bag wallet with honey stick. The paper for the wallet is from the 12" x 12" Patterns and Solids pad. I also used an image and border strip from the 8" x 8" pad. So that's the masculine side of "Flutter." Isn't it fun? 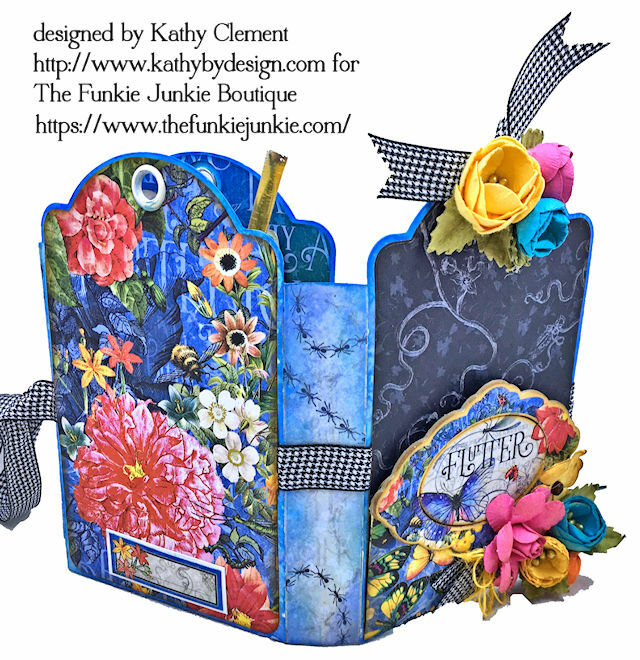 I had so much fun designing this trifold tag folio! 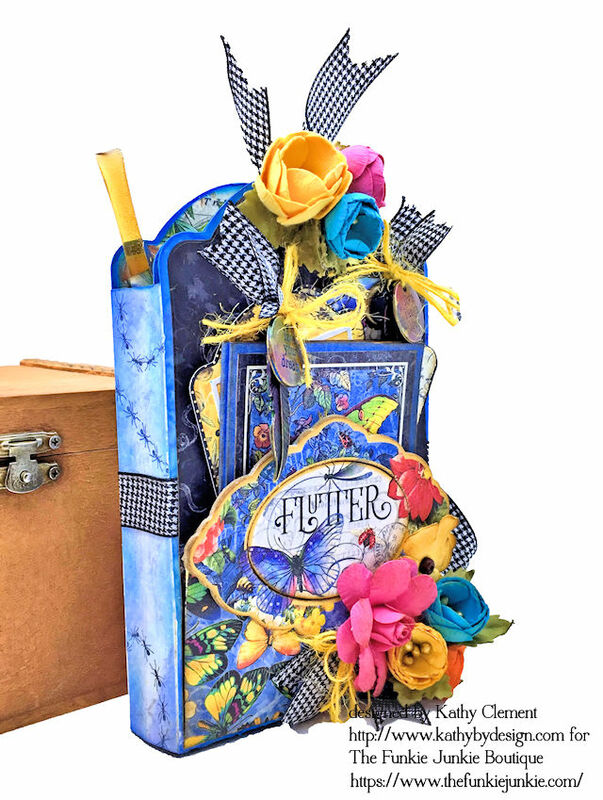 It is filled with interactive elements, vibrant colors and sweet surprises. The base is created with 3 Graphic 45 Large Ivory Tags. 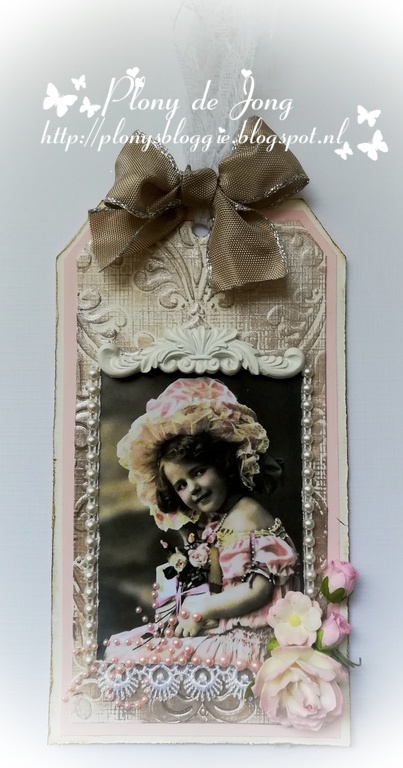 Although it looks complicated to make, you will see in the accompanying video tour and tutorial, it's actually beautifully simple once you know how! The folio is 4" x 6 1/4" with 1" spines. I'm not going to go into a lot of detail here, as you can just watch the 15 minute tour and tutorial to learn more about it. I will share a couple of "teaser" photos, though. I can't get over how gorgeous and detailed these patterned papers are! 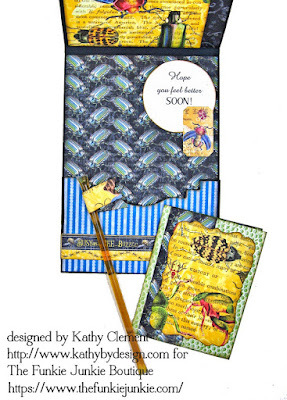 So are you ready to get your craft on? I hope you enjoy this short video tour and simple tutorial. This is not a full step out, mind you. It just guides you through the construction of the folio base, then leaves you to decorate according to your own personal tastes. I hope you enjoy! Thanks so much for sharing your Saturday with me! Wishing you all a joyful and creative weekend! Hi everyone and welcome! It's Jenny here hosting the latest challenge 'Haunted Halloween'. It's time to get your freak on and go all out for Halloween. We want to see your ghouls and ghosts and things that go bump in the night. It's going to be spooktacular!!! What a great way to get super spooky! We can't wait to see you Halloween makes. Make sure you link your projects below to be in with a chance to win and join us next week for even more projects from the Funkie side of the team.